If you have Algae in your fish tank, don’t panic it’s completely natural to have a small amount. In my tank, I have a small amount and It makes my tank look natural and fits the scene I am trying to create. However, excessive algae look terrible and needs sorting quickly before it gets out of hand. 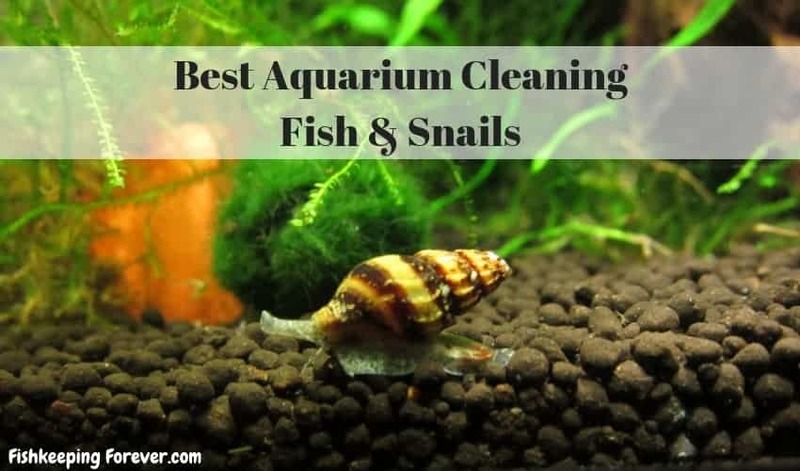 Believe it or not, there are fish and snails that can actually help you clean your aquarium. The first step and the most important step is to figure out why you have excessive algae and dirt in the tank, to begin with. Maybe your tank is positioned in front of or near a window and is getting direct sunlight? Maybe, you’re overfeeding your fish and this is cause moldy food on the floor of the aquarium which will encourage algae growth. Lack of water changes will also cause algae growth and a build-up of dirt in your aquarium. Ensure you do at least 20% opinion, it makes partial waters changes every 10-14 days. It’s our responsibility as fishkeepers to give our fish the best possible environment to live in. If we don’t provide the best water conditions possible you’ll find that your fish will soon become sick and may break out in Tropical fish disease. This will then need urgent treatment and could result in your losing some of your beloved fish. Fix the problem first and then if it doesn’t solve the issue then you can ask for a little help from the fish! Many fish and snails can actually help you keep your fish tank clean. They feed on the algae growth in the tank all day long and some will also burrow in the substrate which loosens the gravel or sand and allows the filter to pick off any trapped dirt. Don’t rely on these fish to do all the work, you cannot simply add loads of cleaning fish and expect to do no work yourself. This is not a reason to stop doing regular maintenance or water changes. It’s just a little helping hand from our tropical friends. Let’s have a look at some of the best freshwater aquarium cleaning fish & snails that are suitable for a freshwater tropical fish tank. When it comes to efficient aquarium cleaners that can also add a little unique pizzazz to their environment you can’t beat the freshwater snail! They are fascinating little inhabitants that can be sourced in a variety of species. Known for their diet of algae, dead plant matter, uneaten food, and other aquarium debris, the freshwater snail can also be interesting to watch. It is true that they move slowly, but anyone who has watched them, as I have, work their way across dirt aquarium glass cleaning it as they go will agree. Freshwater snails are easy to care for only requiring water parameters that do not change abruptly, and plenty of calcium in their diet to keep their shells healthy and strong. It is also a good idea to give your freshwater snails food that is specifically for them, not every aquarium will provide them with all the nutrition they need. Popular types of freshwater snails include the assassin snail who will easily rid your aquarium, not only of debris but also of any pest snails you may have. Be careful, however, as they may eat other snails you have purposely put in your aquarium. The mystery snail is also regularly picked due to its variation in patterns such as stripes and spots on its dark-colored shell. Mystery snails are readily available in most aquatic stores. Freshwater shrimp have to be one of the most interesting additions, fish aside, that you can have in your aquarium. They are voracious little cleaners and incredibly active making them a joy to watch. They move much quicker than their slower clearance counterparts, the snail, but require, perhaps, a little more care. The basic requirements of the freshwater shrimp vary dependent on the species so some research will be required before choosing them. They all, however, need additional food sources other than the algae that they so love. Freshwater shrimp are not picky eaters so will pretty much eat anything you feed them including tropical flake, algae rounds, and shrimp pellets. Care does need to be taken with freshwater shrimp due to them being relatively small and unprotected from predatory aquarium mates. Species like the Amano shrimp, however, at two to three inches are perfectly suited to community aquariums as they are generally too large to eat. Favorites amongst the freshwater shrimp world include the ghost shrimp who can easily hide in your aquarium due to his translucent appearance. These freshwater shrimp are fabulous scavengers, easy to care for and incredibly peaceful. Then there’s the red cherry shrimp who in complete contrast to the ghost shrimp will stick out in your aquarium like a sore thumb. They are bright and vibrant, non-aggressive, and easy to care for. The bristlenose pleco is one of the most sought after plecos due to its smallish, for plecos, size, and its unusual bristles that protrude from their heads. They are usually brown, black, or grey in color with various patterns on their armored plated bodies. Growth can be up to five inches but is usually a little smaller, and they are suitable for twenty-five gallon plus aquariums. As well as being exceptional algae eaters the bristlenose pleco is a real master of disguise. They will sit motionless for hours, blending in with their environment exceptionally well. When they are on the move, you will often see them either working their way across the aquarium floor or sucking on the inside of the glass, removing the algae goodness. To ensure there is plenty of algae for your bristlenose pleco, add driftwood to their aquarium which grows their favorite food easily and readily. Speaking of algae, bristlenose plecos cannot live on algae alone! They need a well-balanced diet to maintain their health which should consist of 85% plant matter and 15% protein. For this reason, it is recommended you also feed them a specifically designed bottom dwelling herbivore food such as sinking pellets or wafers. Bristlenoses also love blanched veggies such as cabbage, carrot, cucumber, and peas. Be careful which plecostomus you buy as some of them can great to over 15″ in length and need a large aquarium. Despite the name which blatantly shouts that it is an aquarium cleaner the siamese algae eater is not that well known. This seems a real shame to me, as they are not only good at cleaning but they are also social, active and rather striking in appearance. Gold to grey with a thick black stripe that runs down the middle of their body, head to tail, they are lithe, and kind of, well cute. Growing up to around six inches in length the siamese algae eater can be kept in aquariums of twenty gallons and above. They are happily kept in groups or solitary. Groups, however, will prove to be more interesting as they will shoal together and feed together in the same areas. Whether kept in a group or alone the siamese algae eater requires a sand substrate to prevent them from injuring their delicate bodies when searching for food and plenty of places to hide. Siamese algae eaters will tend to hang out near somewhere they can retreat to and with which they are familiar. Nutrition wise, like virtually every other aquarium cleaning species the siamese algae eater, will require additional foods to those that it will scavenge. They are not picky eaters and will love foodstuffs such as a flake, pellet, algae wafers, and live foods. Brine shrimp and bloodworm are particularly popular with this species. Take care, however, as if you feed the siamese algae eater too much they will probably stop eating algae altogether. A lot of fun and generally easy to keep, loaches are a species that really need to be kept in schools of their own kind. They have been known, when kept singularly, to literally become so lonely that they will pine away. Not something that anyone wants, I’m sure you’ll agree? When choosing a loach species care needs to be taken as some species can be aggressive not only to other members of the same species but also to others. Since this aggression can involve biting, monitoring new additions to your aquarium would be advisable. Loaches enjoy an aquarium that has plenty of hiding spaces for them to retreat to when they are being inactive. They will also need a well fitting lid as they are quite the adept jumpers when they want to be. You should not use them to clear snail infestations as only the most aggressive loaches are capable of this. And even then they may struggle with the larger and tougher shelled snails out there. Popular species of loach include the rather large, twelve inch, clown loach with its gorgeous orange and black banding, the nocturnal kuhli loach that spends most of its day curled up and cozy, and the rather remarkable black and cream weather loach. This species is popular for its sensitivity to changes in barometric pressure. Incredibly active anyway they become extra so during weather changes. This makes them a delight to watch who provide plenty of aquarium action. We also like the lesser known Yoyo loach, easy to care for and very peaceful community loach they make a great aquarium cleaning fish and well worth a look. Platies are a fairly small and peaceful species that not many people would equate with being good at aquarium cleaning. They are, however, omnivores that will as the term omnivore suggests eat anything including the waste in your aquarium. They come in a variety of colors such as red, yellow, orange, black, silver, and green. 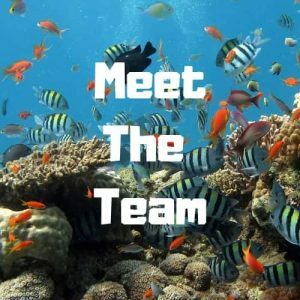 They are a great addition to any community aquarium. Varieties of platies that we would recommend are the red platy, coral platy, blue moon platy, wagtail platy, tuxedo platy, salt and pepper platy, and the mixed platy. Molly’s are also a peaceful species that not many would think of as one of the best aquarium cleaning fish. They do, however, have mouths that make them perfect for this very task. The jaw of the molly can protrude forwards and become a remarkable scraping tool ideal for rasping algae from plants and rocks. Like other species, they cannot live on algae alone and should also be fed a diet of tropical flake and treats such as bloodworm. Varieties of molly that we would recommend include the dalmation molly, black molly, lyretail molly, sailfin molly, gold dust molly, and the rather cutesy balloon molly. If you are looking for a delightful, easy to keep, bottom-dwelling aquarium cleaner you can’t go far wrong with the corydora catfish. They are suitable for the majority of aquarium sizes and can live happily with most small or medium sized fish. They do, however, need to be kept in groups, the larger the better, with a soft substrate for them to scavenge around in. There are hundreds of corydora species to choose from with some being easier to obtain than others. Bronze corydoras, for example, are available in just about any aquarium store and easily the most popular choice. This species needs to be kept in a group and comes in color morphs such as green, bronze, albino, and black. They are known to shimmer when the aquarium lights catch them just right. Other popular but less easily available corydora species include the panda cory which is highly social and loves to be with others. In fact, they are so social that they may school with other bottom-dwelling species of fish that are not from the corydora family. Panda corydoras are a silvery pink with black markings including a band over the eyes. I also have a soft spot for the Corydoras Sterbai, They are very active cory and have a great personality especially when feeding. If you have Cory catfish you have to read our article where we reviewed the Best Food For Catfish. Some of the results will help you feeb your catfish with a better quality catfish food at the best prices. We really like Wardleys Shrimp pellets for our bottom feeders which offers a different food source from the normal pellets and flake foods your catfish might be used to. We purchase ours from Chewy.com one of the largest online retailers. We have provided a link above to make it easier for you. The three stripe corydora is another popular species that is often confused with another variety, the julii. The three stripe has a series of spots on its forehead that are connected together in a long string giving them a maze-like appearance. The julii, on the other hand just has spots. The three stripe is a particular favorite of mine. The American Flagfish is probably not a species that many aquarists are particularly aware of. This would be mainly because they are only sporadically available in fish stores making them not the easiest to source or spot and learn about. It’s a great shame, as far as I’m concerned, as this fish is not only a pretty good aquarium cleaning fish but also amazingly beautiful and interesting. Native to Florida and commonly found in the slow-moving, heavily vegetated waters there, the American Flagfish grows to a maximum of two inches and can live for around five years when cared for properly. They are pretty aggressive fin nippers so should only be kept with fast swimming fish or in a species only aquarium. Males are also territorial so require a lot of space when kept together. Appearance wise the American flagfish resembles, as the name suggests, the American flag with its red stripes. Place them in an aquarium with a dark substrate and the colors on them will really pop as they swim around feeding on algae in their aquarium. As algae makes up the main part of this species diet, they require an algae-based food to be given to them several times a week. These two species are often confused for one another despite one having just a red tail and the other having all red fins and tail. 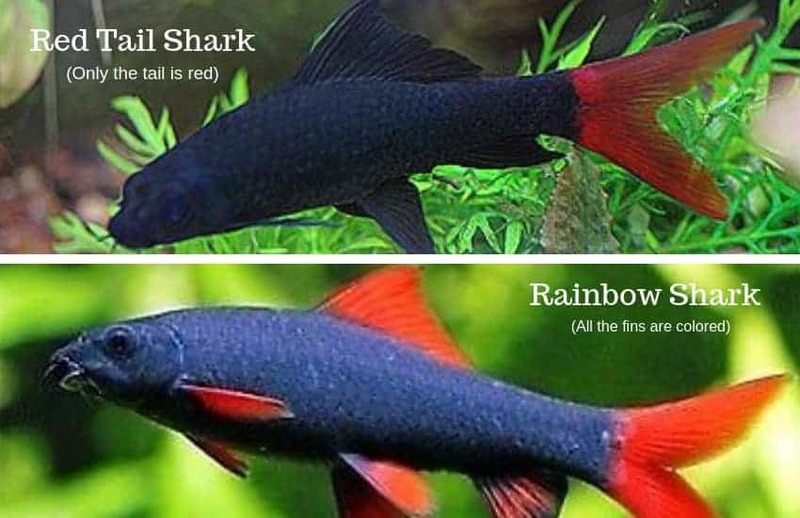 They both have a lithe black body that makes the red stand out magnificently and creates a really impressive looking fish. Of course, neither the red tail nor the rainbow are true sharks, rather they are named so for their erect dorsal fins. Both Rainbows and Red-tails are actually members of the carp family. It is best to keep only one of these species per aquarium unless they can have a huge space for themselves. Juveniles are more timid than adults but don’t confuse this with you being someone who has picked a ‘friendly’ one! Like their namesakes, both the rainbow and red tail have the possible aggression of their namesakes, the shark. They can be highly territorial and have a relentless willingness to chase invaders away. Both species are incredibly active and always busy doing something, which is usually searching for food. Speaking of food both the rainbow shark and the red tail are omnivores that feed on plants, crustaceans, and small insects. Their diet needs to be of high quality with a pellet, live, and frozen foods being included. They are also fabulous scavengers that have two pairs of barbels they used to scrape food free and move to their down-turned mouths to eat with ease. Both species make great aquarium cleaning fish. The term earth eating cichlid is rather misleading as these species of cichlids such as the popular demon eartheater do not actually eat dirt. Rather, they employ a method of feeding that by which they take up mouthfuls of sand which they sift for edible items. Remaining materials, the dirt, is then expelled via the gill openings. Naturally found through much of the Amazon river basin in Brazil, Bolivia, Ecuador, and Colombia the earth eating cichlid such as the demon eartheater are very peaceful unless breeding. They will also not predate on any species of fish that is larger than a few millimeters. Care requirements include that they must have soft sandy substrate to sift through as coarser materials will inhibit feeding. It is entirely possible with gravel and such that the gill filaments of the earth eating cichlid could be damaged or that pieces could be ingested. This may lead to internal damage and blockages. Earth-eating cichlids are also, and this is highly important, very susceptible to bad water conditions and they do not like bright lighting. Relatively dim lighting is suggested with driftwood, scattered roots, and plenty of branches for them to hide out under. So which ones will you choose? Well, it will all come down to the type of aquarium you have. If you have a peaceful community tank then your options are huge but if you have a larger more aggressive aquarium then you will find that your choice of suitable cleaning fish for your aquarium is reduced.